February 4th, 2011 9:16 AM by Lehel S.
Home values are falling at an accelerating rate in many cities across the U.S. The Wall Street Journal's latest quarterly survey of housing-market conditions found that prices declined in all of the 28 major metropolitan areas tracked during the fourth quarter when compared to a year earlier. The U.S. housing market may take five or six more years to recover, TrimTabs Investment Research warned recently. Madeline Schnapp, director of macroeconomic research at TrimTabs, talks to MarketWatch's Alistair Barr about what that means for the world's largest economy. The size of the year-to-year price declines was greater than the previous quarter's in all but three of the markets, the latest indication that the housing market faces considerable challenges. 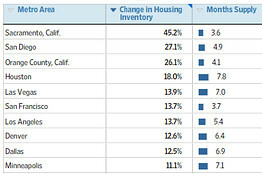 Inventory levels, meanwhile, are rising in many markets as the number of unsold homes piles up. 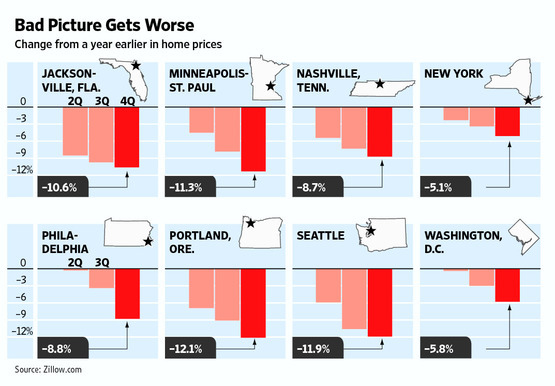 Home values dropped the most in cities that have already been hard-hit by the housing bust, including Miami, Orlando, Atlanta, and Chicago, according to data from real-estate website Zillow.com. But price declines also intensified in several markets that so far have escaped the brunt of the downturn, including Seattle and Portland, Ore.
See housing data for 28 major metro areas. Falling prices are a reflection of weak demand and tight credit conditions that reduce the number of potential buyers. "There are just not a lot of renters with confidence, with a down payment, with good credit, and without a lot of additional debt," said John Burns, a homebuilder consultant in Irvine, Calif.
On the inventory front, New York's Long Island had enough homes on the market at the end of December to last 15 months at the average sales pace. The supply of unsold homes stood at 14 months in Charlotte, N.C., and Nashville, Tenn., and at nearly 13 months for northern New Jersey. Markets are generally considered balanced when the supply is around six months. A few markets, including Sacramento and San Diego, are seeing inventories fall to healthier levels as low prices spur interest from first-time buyers and investors, while others, such as Washington, D.C., and Boston, have been cushioned by more stable economies. "We're still running at half speed," said Jeffrey Otteau, president of Otteau Valuation Group, an East Brunswick, N.J., appraisal firm. "Sales are below year-ago levels and inventory is higher than it was a year ago." Far-flung suburbs continue to fare worse than homes located closer to core metro centers, he says. Economists say that the biggest risk to the housing market is that job growth doesn't pick up. "Without improvement in unemployment, confidence stays low. Purchasing stays low," says Stan Humphries, chief economist at Zillow. Market conditions could get worse in the months ahead. Millions of homeowners are in some stage of foreclosure or are seriously delinquent on their mortgages, and millions more owe more than their homes are worth. Real-estate agents are bracing for an uptick in distressed properties hitting the market, including foreclosures being sold by banks and homes sold by owners via a short sale, in which banks agree to a sale for less than the amount owed. Sales of foreclosed homes are partly responsible for reducing home values because banks tend to reduce prices quickly to sell the homes. Sales of foreclosures slowed in some markets at the end of last year as document-handling problems raised questions about the integrity of their foreclosure processes. But that could change as banks pick up the pace of foreclosures. Real-estate agents say that the threat of future price declines has led to a months-long standoff between buyers and sellers. Sellers spurn what they see as low-ball offers, while buyers are demanding discounts because they are "convinced prices will drop further, and they don't want to feel like suckers six months later," says Glenn Kelman, chief executive of Redfin Corp., a Seattle-based real-estate brokerage that operates in nine states. The result is that "it's high noon at the O.K. Corral on every single transaction." Agents say that sluggish housing markets are requiring sellers to become much more realistic about setting prices that will spur dealsthe prices they set. After receiving no offers on a three-bedroom home in Oceanside, Calif., during the first week on the market, real-estate agent Jim Klinge convinced the seller to slash $30,000 from the price, to $420,000. That drew two full-price offers, and the home sold last week in an all-cash deal. "The drop in price was critical to reignite urgency for buyers," said Mr. Klinge. Some sellers have opted to pull their homes from the market rather than lower their prices, either because they believe values will improve or because cutting the price would mean selling for less than the amount owed to the bank. "I know so many people here who are unwilling landlords," said Mr. Kelman. "They're now spending their Friday nights fixing leaky faucets for the tenants they've brought into their house."